I think it was on Friday that I joined in an exchange with a few Twitter friends sharing how much I love my slow cooker. I'm pretty convinced that put the idea into my brain to peruse my slow-cooker cookbook late Friday night. We'd already eaten chicken that week and we were out of beef, but we did have pork, baby back ribs in fact, from a family friend's farm. Aha! It's hard to believe, but I had yet to make ribs in my crock-pot. I don't know what I was waiting for, but I figured it was time to give it a try. As usual I didn't have everything the cookbook recipes called for, but I was able to take inspiration from two recipes. The results - Amazing! (If I do say so myself.) The meat pretty much fell off the bone, just a slight tug and they melted into our mouths. Oh yes, we will be doing this again. Stir together all the ingredients except the ribs and sesame seeds in the crock-pot insert. Add the ribs to the insert and turn them around a few times to coat both sides of each rack with the sauce. 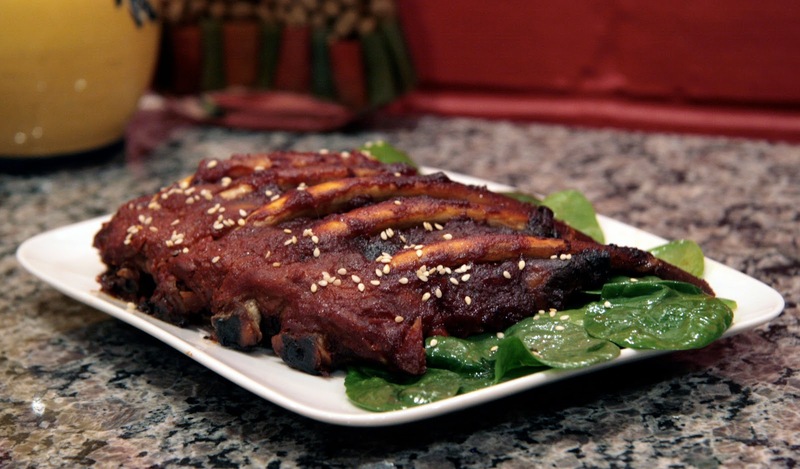 Serve the ribs with a sprinkle of toasted sesame seeds on top. Do you make ribs in your slow cooker? Any flavor combos you love?